The Bar at the Hanover Manor is open at 5:00, the board normally breaks up at 5:30 and the general meeting begins at 6:00. Business is conducted during dinner and our speaker goes up around 7:00 for a one hour presentation. Meetings are generally over at 8:00 unless the Q & A is spirited. See the calendar below to access meeting information, we will keep this updated and add meeting content as we have new information. During the winter, we will post notices here if a meeting has to be canceled. AFAA National Meeting and Code Conference – Hilton Orlando. Director Mikutsky will be speaking at our meeting. Richard Mikutsky who was appointed Director / State Fire Marshall of the Division of Fire Safety by Governor Philip Murphy in April, 2018. The Division of Fire Safety is the state’s central fire service agency responsible for the development and enforcement of the State Uniform Fire Code, as well as for implementing public education and firefighter training programs. As State Fire Marshal, Mikutsky will be the lead state official in charge of ensuring people comply with fire codes, investigating fire-related accidents and crimes, and directing fire prevention efforts. 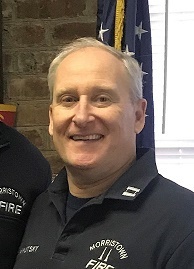 Prior to joining the Division of Fire Safety, Mikutsky served as a career fire captain for the Morristown Fire Bureau in Morristown, NJ, where he worked for more than 32 years until his retirement in February 2018. He also was the Executive Vice President of the New Jersey State Firefighters Mutual Benevolent Association, which is the statewide union representing approximately 5,000 career firefighters, EMTs, and dispatchers. Previously, he served as Vice Chairman of the N.J Police and Firemen’s Retirement System Board of Trustees.